Chocolate Icebox Pie – Learn to make Chocolate Icebox Pie topped with whipped cream and nuts from the vintage 1950’s cookbook, Recipes from Old Virginia. Recipes of two centuries collected from the kitchens of the Old Dominion, together with the latest recipes used by the foremost cooks. Tested and approved. I love old cookbooks and cooking magazines; on weekends, I scour antique stores and flea markets looking for books that pique my interest. I’ve gathered quite a collection… some of my volumes date back to the early 1900’s. I can’t tell you why I choose certain books over others. Sometimes I pick based on the title, or the subject matter. Other times it’s the feeling I get holding the book in my hand—the smell of the old pages, the smudge of frosting the previous owner left as they cooked. 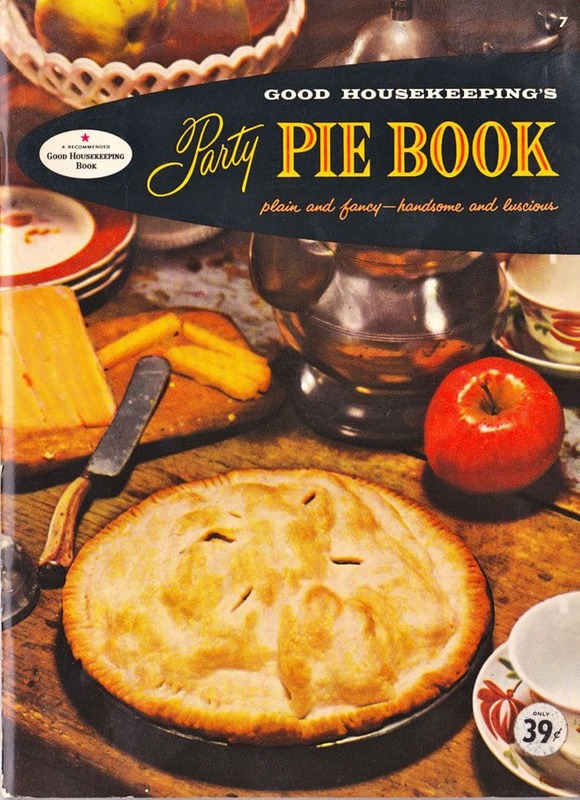 I have a particular fondness for old community cookbooks published by church groups, junior leagues, and civic groups. I actually read through them for fun, like novels. They make me feel connected to the people who wrote them– the families and housewives and volunteers who compiled them. But the best part is recreating the recipes. Sometimes they are a disaster, but more often than not I end up with a delightful dish that is also a slice of the past… like today’s recipe, Chocolate Icebox Pie. Here is the original recipe as written. The directions of this recipe were a bit sparse, and there was no crust or whipped cream recipe included, so I had to clarify things a bit. Combine sugar, salt, and flour. Add the melted chocolate and ¼ cup of the milk. Add the remaining milk, water, and egg yolks. Cook over low heat until thickened. Remove from heat and add marshmallows and butter. Blend well. 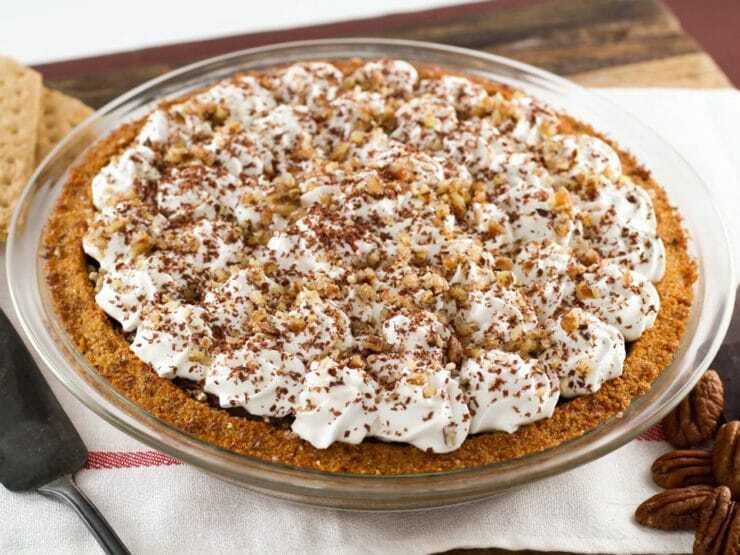 When cool, pour into graham cracker crust, garnish with sweetened whipped cream sprinkled with chopped nuts and grated chocolate if desired. –Mrs. Elwood Harris, Sussex County. I chose the cream topping option because I had some heavy whipping cream in the fridge. Use 1 1/3 cups graham cracker crumbs (about 16 crackers), ¼ cup of butter or margarine, ¼ cup granulated sugar. Let butter or margarine soften. In 2-cup measuring cup, mix 1 1/3 cup crumbs, sugar (if any) and butter with fork until crumbly. Set aside 3 tablespo. With back of spoon, press rest to bottom and sides of 9” pie plate, forming small rim. Bake at 375 degrees F. 8 min. Cool; fill as desired; top with reserved crumbs. I followed the crust recipe closely, but found it a bit dry, so I added another tablespoon of butter and this made it the right consistency. I used the entire amount for the crust (rather than sprinkling some on top), but my pie dish is likely deeper than a 1950’s pie plate. The crust baked up beautifully, and really complimented the Chocolate Icebox Pie. Delicious! According to the cookbook, this recipe was contributed by Mrs. Elwood Harris of Sussex County, Virginia. What a neat pie! So tasty, and relatively simple to make. 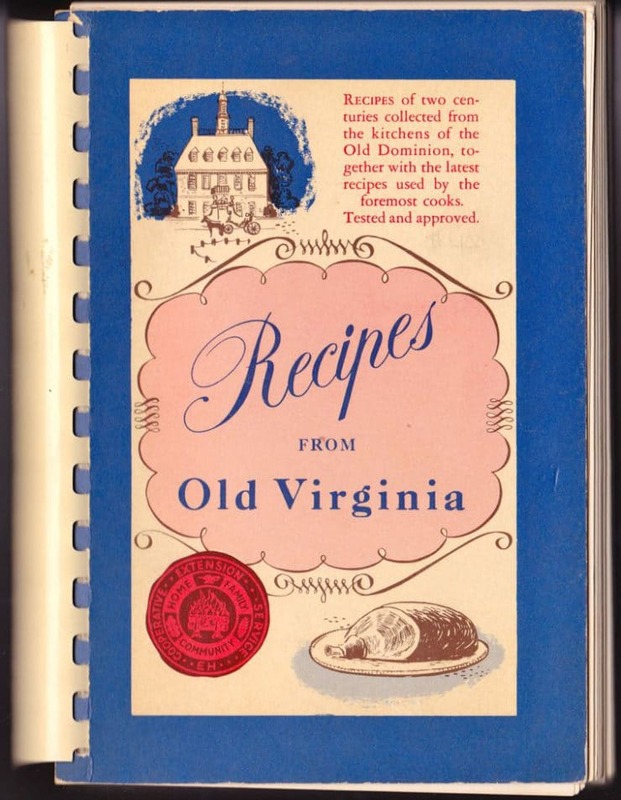 The Recipes from Old Virginia cookbook is 53 years old, so most of the contributors would be over 70 years old today. I wish I knew if Mrs. Harris was still with us so I could thank her for this awesome recipe. 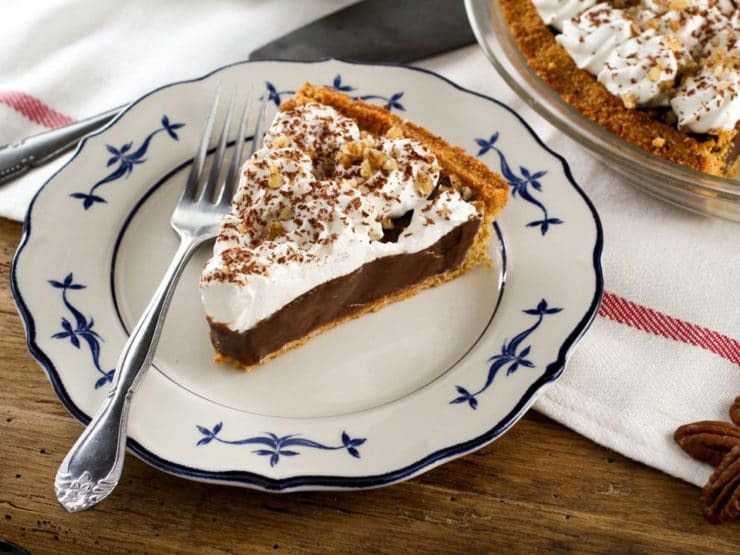 Learn to make Chocolate Icebox Pie topped with whipped cream and nuts from the vintage 1950's cookbook, Recipes from Old Virginia. 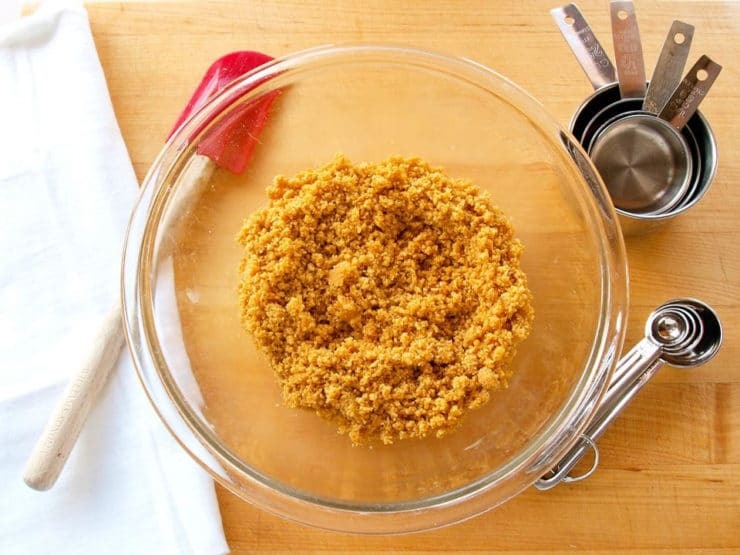 Preheat oven to 375 degrees F. In a small mixing bowl, combine graham cracker crumbs, butter, and sugar. Stir to blend ingredients until all crumbs are evenly moistened by the butter. 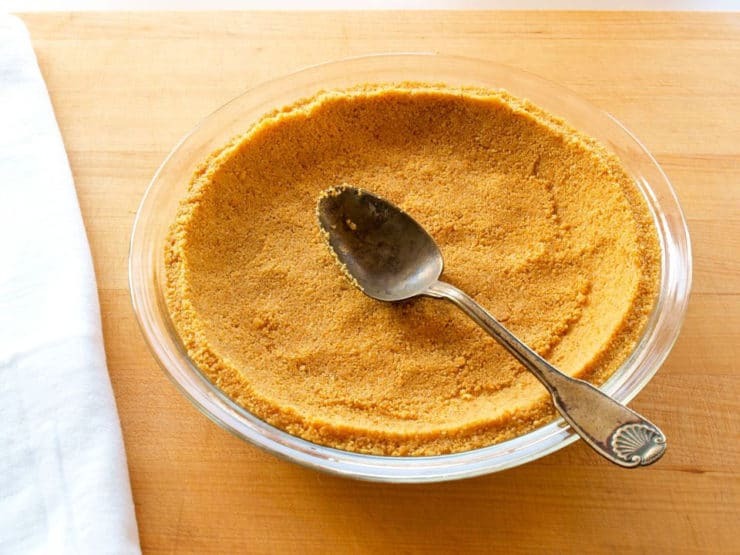 Pat the graham cracker mixture evenly into a pie plate or dish using the back of a spoon, covering the bottom and sides of the dish completely to form a crust. Bake the crust for 8 minutes in the oven till crust hardens. Cool before filling. 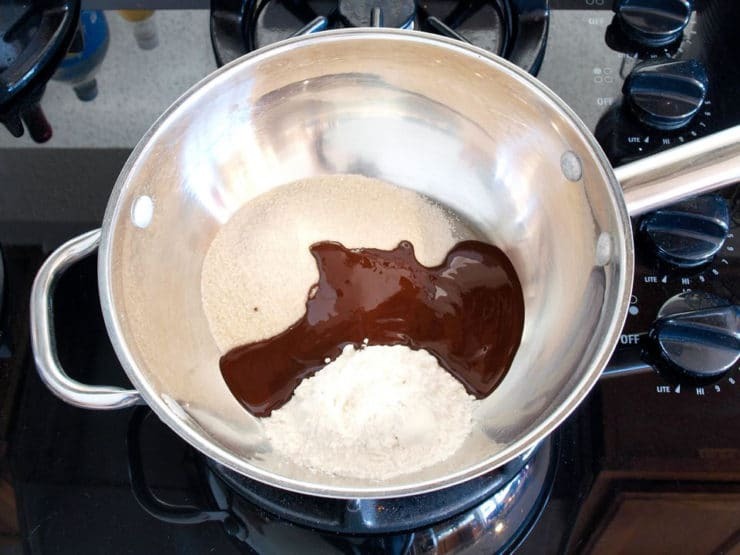 Combine 2/3 cup of sugar, salt, and flour in a small saucepan. 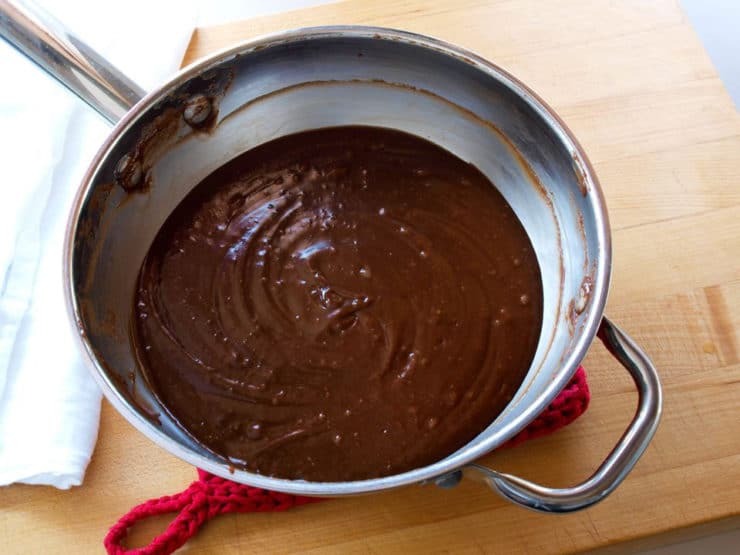 Melt chocolate squares (the easiest way is to melt it in a small dish in the microwave), then add the melted chocolate to the dry mixture along with the evaporated milk or cream. Whisk together to blend ingredients. Add 1 cup of water and beaten egg yolks, whisk again. Turn heat to medium low and continue to whisk for 10-15 minutes. The mixture will heat slowly and take on a thicker consistency and become a custard. Don’t leave the pan alone for very long or the custard will burn/congeal to the bottom of the pan. 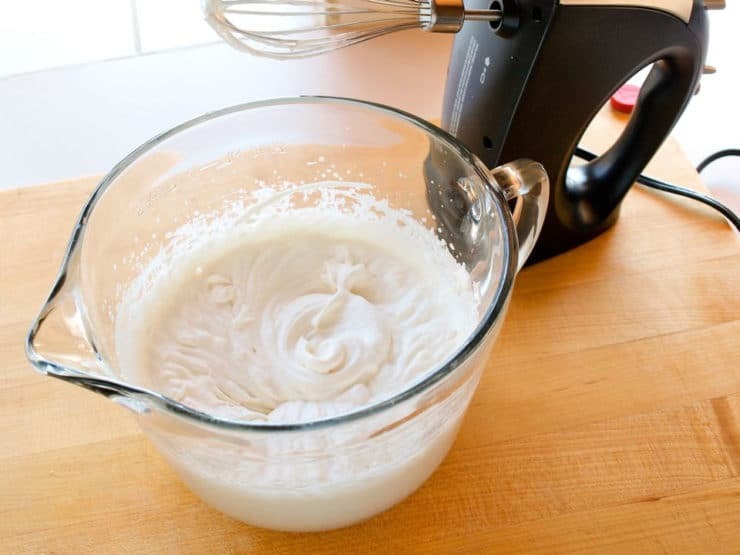 Continue whisking until the custard thickens and begins to stick to the whisk in small lumps. Remove from heat. Melt in the butter, then whisk in the marshmallows, which will melt into the custard. Let mixture return to room temperature. 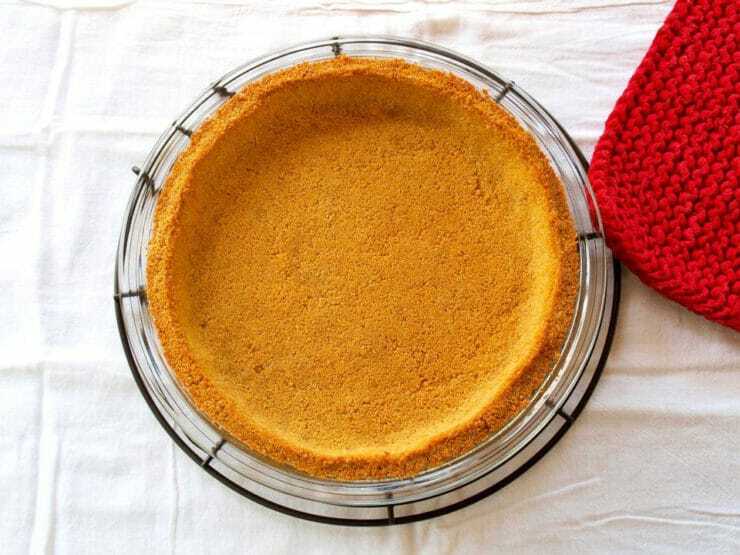 Fill cooled graham cracker crust with the custard. Place pie uncovered in the refrigerator and chill for at least 6 hours till set (preferably overnight). At least 1 ½ hours before serving, combine 1 cup of heavy whipping cream and 2 tbsp sugar in a medium mixing bowl. Whip on medium high for a few minutes until the cream is light and fluffy. Spread the freshly whipped cream on top of the pie with a spatula. If you have more time and want a more elegant presentation, you can pipe the cream across the top of the pie with a star tip. 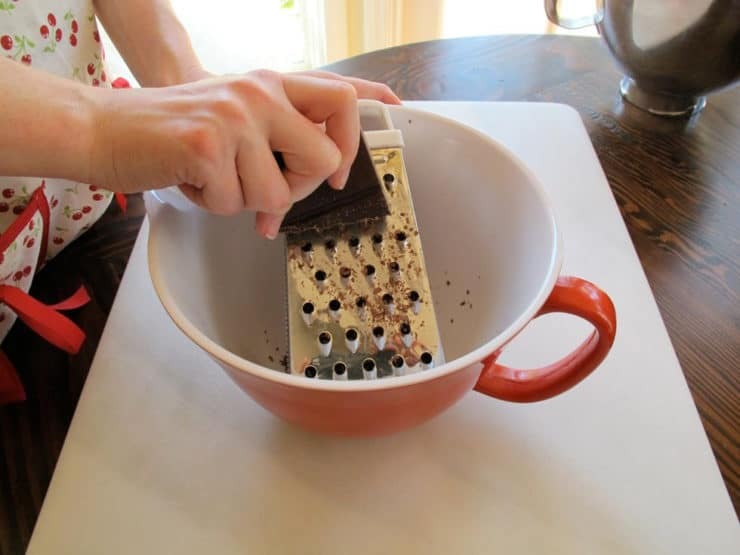 Grate semisweet chocolate into 2-3 tbsp of chocolate shavings. 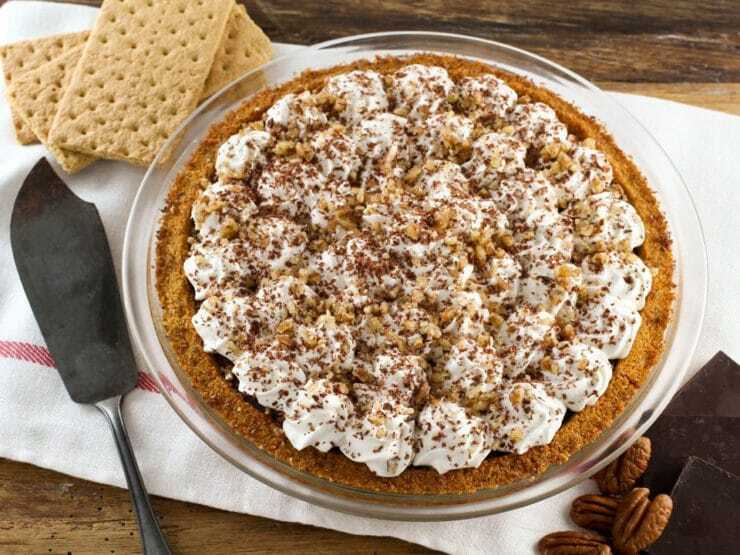 Sprinkle the chocolate shavings onto the top of the pie, along with 2 tbsp chopped pecans. Chill for at least 1 hour longer before serving. Note: This recipe was tested with both regular marshmallows and kosher marshmallows. The regular marshmallows melted into the chocolate filling, whereas the kosher marshmallows only partially melted, giving the filling a "rocky road" effect. Both results were delicious, so feel free to use kosher marshmallows if you prefer. I did a Google search because I like the challenge of it, and found that Mrs. Elwood Harris is deceased. I’ll thank her anyway. My Grandma used to make a pie that was almost clear and was delicious. Does anyone know what that pie might be? Just a quick question, are there any ingredients or steps that I can choose not to do if I’m either too lazy or unable to find the ingredients. I wouldn’t suggest changing the recipe. With desserts and baked recipes in particular, it’s important to follow all steps as written for best results. I have a question about the 1 3/4 chocolate squares (which I read from a previous post = 1 3/4 ounces). 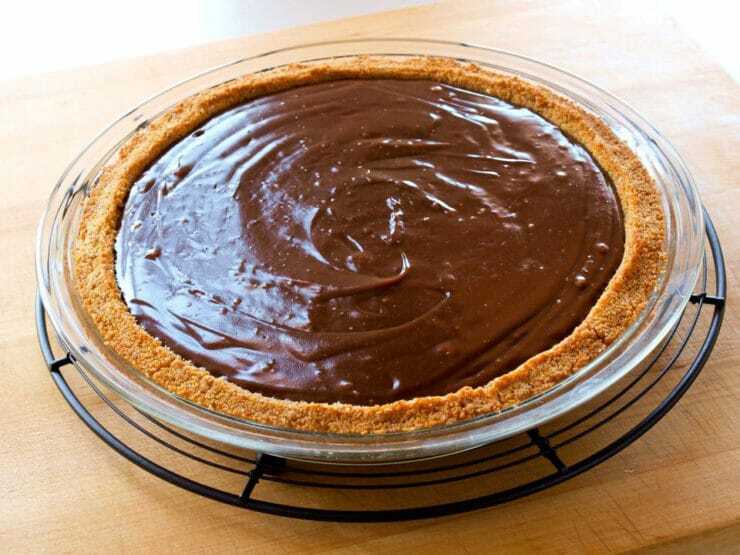 I am not a super experienced baker, but that doesn’t seem like very much chocolate for a whole pie. Is it because unsweetened chocolate is denser than sweetened chocolate? Thank you! Hi Autumn, Tori’s assistant Ashley here. When you use unsweetened baker’s chocolate you don’t usually need as much as you’d think. It has a stronger, more bitter flavor and you only need a small amount. Hope you enjoy the pie! Just finished making this pie; the chocolate filling turned out beautiful. I like this way better than our family’s chocolate cream pie recipe . To ensure a smooth creamy chocolate filling I used a electric hand beater to blend the filling after adding the marshmallows. (I used 354ml can of evaporated milk instead of cream.) I didn’t use the graham crust recipe you posted; just went with my own graham wafer crust recipe only because it’s my go to recipe & I could see myself struggling with using soft butter :). (1 1/2 c. graham wafer crumbs; 6 Tbsp. melted butter; 1/4 c. granulated sugar; bake @350F x 10 minutes). Love your site! In the Chocolate Icebox Pie recipe there is a call for “1 3/4 squares unsweetened chocolate.” I noted that some grocery stores do not carry squares or bars and /or the weight/shape of the chocolate has changed. What is the weight of a single ounce as cited in the recipe? 1 square of chocolate = 1 ounce. I work at a Bed & Breakfast in San Diego, and I tried this recipe and everyone Loved it. Surely will use baking macadamia nuts in the crust when we try this delicious recipe! 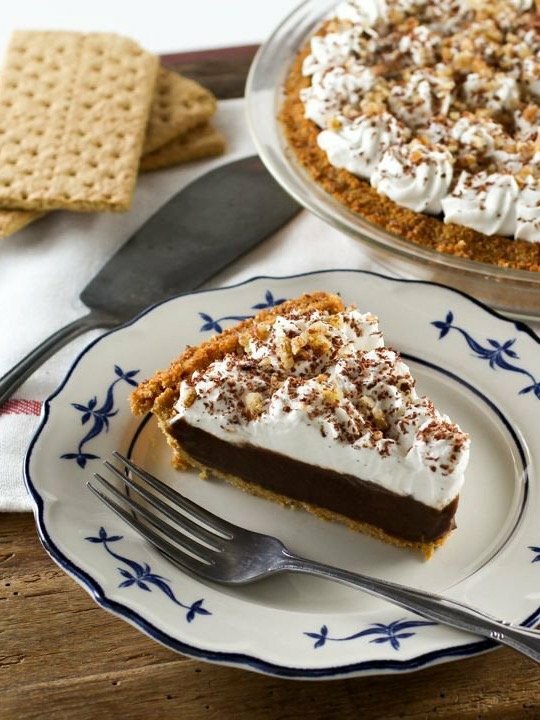 Your Chocolate Icebox Pie looks yum-‘luscious! I love chocolate and vintage cookbooks like you. It’s hard for me to pass them up when I shop at vintage shops. 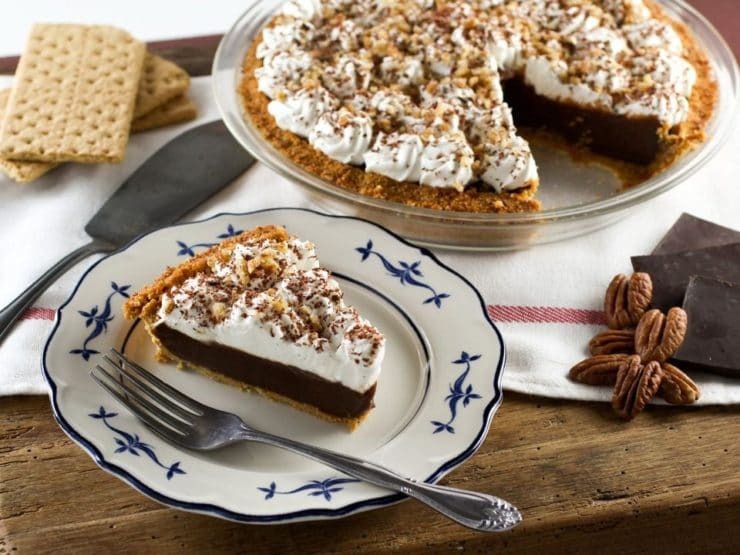 We’re SO making this pie with a crust made with nutter butter cookies instead of graham crackers as the only modification. Thanks so much for posting this recipe! I just this morning purchased a vintage pan with the raised lettering PY-O-MY ice box pie on it and am anxious to try your recipe in it. Mmmm, sounds delicious! I changed a few things .. That I think made this pie even BETTER !! …I kept the filling recipe but I used my fav. sweet Pretzel crust ( 2 cups crushed pretzel sticks,1/2 cup brown sugar & 3/4 cup melted butter ..bake @ 350 for 12 min.& cool) & topped w/ chopped snickers bars instead of pecans.. 3 bars should do.. I love the custard filling !! Love it and pie is great any day of the week. My mother used to make something called “icebox cake” which was made out of chocolate Melody Wafers and whipped cream. The wafers were positioned on their edges and whipped cream was added in between each cookie until it formed almost a log. Then whipped cream was applied to the outside and it was placed in the fridge for several hours until the whipped cream softened up the wafers. It was a real 50s dessert. I loved it when I was a kid. Oh I remember that icebox cake ! our neighbor made it in 1961.. so yummy ! more chocolate, more cream and… more chocolate, please! We LOVE this recipe!! My kids and I have made it several times since we first saw it posted last time. It’s our current favorite! I just made key lime pie tonight. love that kind of pie! if u put peanut butter in there2,it’s even better,imho.